Most people assume that you need to stay clear of massages during the first trimester of pregnancy, however so long as it is carried out by a qualified specialist, it can have huge benefits. Lindsey Seabrook from The Touch massage therapy explains more below. Lindsey operates locally from Feel Good Balham and comes highly recommended for her pregnancy massages. During pregnancy, the body undergoes some significant physical changes to adapt to the life growing inside it. It is an exciting time planning for a new addition to the World. It may also be a time of stress and worry, as the mother has to adapt to carrying a new life as well as starting a new life herself with her newborn. Pregnancy massage can support expectant mothers on a physical and mental level throughout their pregnancy and help maintain a healthy body and healthy mind from conception through to the post natal period. Pregnancy massage, like any other massage treatment, will be tailor made to the exact requirements of the client. The client may well have some of the exact same muscular tension as they had before they became pregnant which can be treated as normal. For example, there may be neck and shoulder tension from using a computer for long periods of time or lower back pain from sitting at a desk all day. However, the client should now be treated with their changing body and growing baby in mind. Relieving muscle pain especially in the lower back where the muscles take the extra strain of your baby weight. Stimulating the part of the nervous system that allows us to relax and de-stress – very important in conception or when carrying a baby. Abdominal massage (if required by the client) which massages the baby as well as helping to support the abdominal muscles that are being stretched. This also helps the digestive system and can decrease indigestion and constipation. Allowing time and space to connect with the baby mentally and really focus on its presence. A fully qualified pregnancy massage therapist will likely massage from conception, through the first trimester and right the way to the post natal period. Often the first trimester is a time when muscles can really benefit from tension relief, especially from pre-existing conditions. It can also help with early pregnancy symptoms such as nausea and fatigue as well as being an excellent way to relax and have some time to yourself. The therapist will know which massage strokes can be used at what stages of the pregnancy and will always have your comfort and individual circumstances in mind. Women should expect to be treated with the care and attention they deserve being an expectant mother. Therapists should ensure that both client and baby are well supported on the massage table and that they are comfortable with the relevant pillows. If they need to move about during the treatment then they should be able to adapt to your needs. Comfort is key to maximising the benefits of the treatment. What do you do with those left over bananas that are getting browner by the day in this heat? 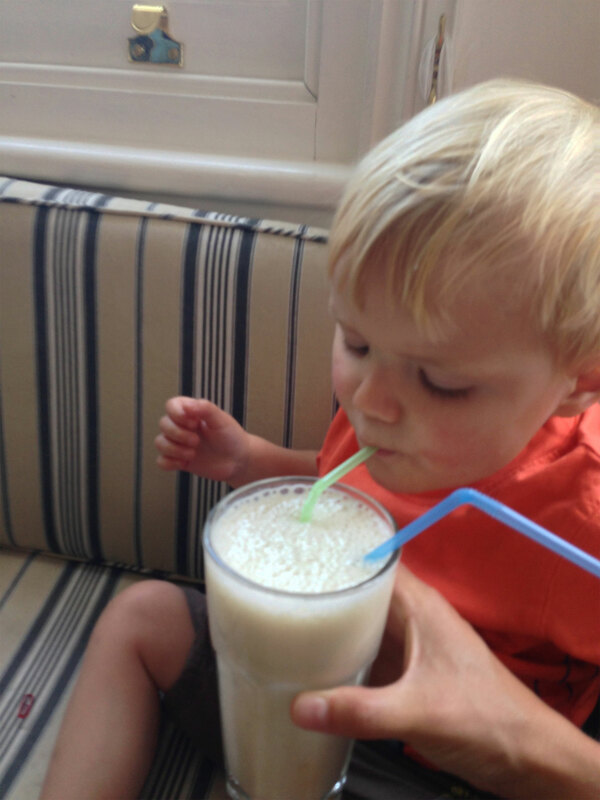 Make some smoothies with your kids. Takes minutes to make, it gives them their fruit portion for the day and they love them. A winner! Freddie helped me make a few this afternoon and he thought they were delicious.